Masing (fifth right) seen during the event at Sebangki Panjai on Saturday, with Mussen (fourth right), Mong (fifth left), Doris (fourth left) and others. 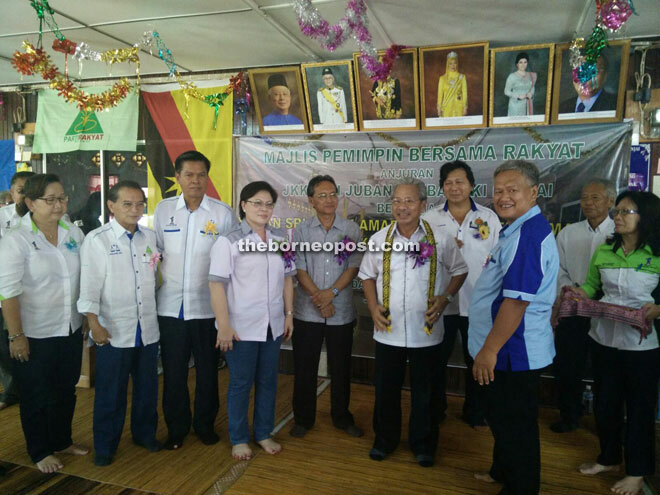 LUBOK ANTU: Malcom Mussen Lamoh has received the blessing from his party, Parti Rakyat Sarawak (PRS), to contest in Batang Ai constituency again during the coming state election. PRS president Tan Sri Datuk Amar Dr James Masing made the announcement during an event organised by the party at Sebangki Panjai longhouse (Rumah Jubang) here on Saturday. Thus he called on voters in Batang Ai constituency to give their support to Mussen. “With this announcement I hope Batang Ai voters who support BN will support Mussen as well. Mussen has got what it takes to be their BN representative in Batang Ai,” he added. Mussen first won the seat in the April 2009 by-election following the death of his predecessor, the late Datuk Dublin Unting Ingkot, by defeating former Lubok Antu MP Jawah Gerang by 1,854 votes, garnering 3,907 votes. He went on to win the seat again in the 2011 state election, defeating Nicholas Bawin Anggat in a straight fight by a majority of 2,741 votes and garnering 4,460 votes. According to 2011 data, Batang Ai constituency has 8,728 registered voters. Before becoming Batang Ai assemblyman, the Batu Danau-born politician was an engineer with the Agriculture Department. Meanwhile, the event at Sebangki Panjai was also attended by Senator Datuk Doris Sophia Brodie, Assistant Minister of Agriculture (Research and Marketing) Datuk Mong Dagang, Mussen himself, Lubok Antu MP Datuk William Nyalau Badak, Lubok Antu district officer Jack Aman Luat and local community leaders. to rule the state after the next election. “I believe voters in Batang Ai have seen the development brought by BN to your area and other areas in the state. There is no reason why they should be voting for other parties other than the ones representing BN like PRS,” he said. Thus, he hoped the people of Lubok Antu would be wise and not listen to incitements, especially from those with their own agenda or the opposition, as the BN government had always fought for what is best for the people. He reminded the people not to believe talks that the state government wanted to take away their NCR land via perimeter survey, which he said was not true at all. The Sebangki Panjai villagers got a shot in the arm when they managed to collect RM45,000 from all the dignitaries attending the event.